I dissected the Eastern Conference Playoffs in yesterday’s post and today we are going to take a look at how the much more fascinating Western Conference Playoffs are going to shake out. There’s not going to be any prosaic preamble today—we’re jumping right in. This was the First Round matchup every NBA fan wanted to see. James Harden returning to Oklahoma City to exact revenge on the franchise that drafted him, low-balled him in contract negotiations and then traded him away. I mean it doesn’t get any more dramatic than that. Harden has had a fantastic season (25.9 ppg, 4.9 rpg, 5.8 apg) and is certainly an MVP candidate—though he has slumped a little lately (in two of his past six games he has shot under 30% from the field). Meanwhile, Durant and Westbrook have been their usual fantastic selves, with Durant putting up an historic 50-40-90 season (51% FG, 41% 3PFG, 90% FT) and averaging 28.1 points, 7.9 rebounds and 4.6 assists*. Though, they seem to be carrying a heavier burden than usual. They know they need to get back to the Finals this year for the franchise to at least save face after the Harden trade; and I firmly believe that a second straight Finals loss might send Durant into some kind of tailspin. This guy just cares so much about the game. I mean, he was distraught, last year. I can see how this series plays out in my head already. Houston steals the first game at Oklahoma City when Harden explodes for 45 points. The Thunder bounce back in Game 2 with Durant going off for 41 and 16. In Game 3, both Durant and Westbrook score 35 points and the Thunder blow out the Rockets at home. In Game 4, Harden and Chandler Parsons both score over 30 points and Asik has a key block on a Westbrook drive late in the game and Houston ties the series 2-2. Back in Oklahoma City for Game 5, the Durant and Harden duel in the first half, but Ibaka gets hot in the fourth quarter and the Thunder win by ten. Game 6…Linsanity takes over. Jeremy Lin scores 36 points and the Rockets win in overtime. The series comes down to Game 7 in Oklahoma City—the crowd is electric. The teams come out sloppy and the game is tied at 42 at the half. No one can hit a shot. Westbrook gets hot in the third quarter, but so does Harden and the game is tied at 70 heading into the fourth quarter. With two minutes left, Houston is up by six points and the Thunder are on the ropes. Suddenly, the LIGHTS GO OUT! When they come back on, Harden is at midcourt and holding a folding chair. He takes out Asik and Chandler with chair shots; a charging Thomas Robinson is met by a flying elbow from Westbrook. Jeremy Lin charges, but Harden lifts him up and Durant delivers a Dudley Death Drop, planting Linsanity right on the Thunder logo at midcourt. The refs don’t know what to do so they disqualify both teams as the Thunder skip off the court. Just kidding. I think this series will be entertaining as all hell. Harden will have one huge game that Houston will steal, while Lin will have one big game that the Thunder stifle. Durant, Westbrook, Ibaka and company are just too good. Prediction: Thunder win series 4-1. I have to hand it to the Lakers. After the most overdramatic, overwrought, and all around crappy season, they finally delivered the goods in their game against Houston on Wednesday night. These Kobeless Lakers are compelling in an odd way. They of course still have Gasol (my God did he play great the other night) and Howard, but there is a certain vulnerability about the entire team now—the points have to come from somewhere without Kobe in the lineup—that is somehow appealing. Or, at the very least, makes their ongoing saga more bearable. The Spurs, well, they have been very un-Spursian lately. They are heading into the Playoffs in a bit of a slump and they seem to be more dysfunctional than usual. If Parker can actually play at full speed, it’s a bonus. If Duncan can hold up under increased minutes, it will be incredible. If Ginobli can give them anything, it will be a Godsend. For God’s sake, they just signed TRACY MCGRADY! Yet, I can’t count the Spurs out. They still have Kawhi Leonard, Tiago Splitter, Danny Green, Gary Neal and the rest of their “company men” role players. Plus, I think people are jumping on this Lakers bandwagon a little too quickly. Steve Blake played above his head for two games (and that’s not saying much) and Jamison turned back the clock slightly in the game against Houston. Nash is still hobbled, as is Metta World Peace. Howard looks healthier than he’s been all season, but it’s going to take him playing top-flight defense and Gasol notching near triple doubles in each game for the Lakers to even have a shot at pushing this series to seven games, let alone winning it. Some of the games will be close, but I just don’t see it happening. I know many NBA writers (like the Lord and Master, Zach Lowe, whom I pray to approximately three times a day to thank him for his excellent observations) were hoping that the Nuggets would match up against the Rockets in the First Round and thus pair up perhaps the two most exciting offenses in the entire league. But, my question is: couldn’t this series be just as good? Look, I’ve been sweet on Golden State since before the season started, and I know that they have cooled off considerably since their hot start. I know that the Bogut experiment has been somewhat of a disaster, that their defense has stalled and that Barnes has not been great as a rookie*. But, holy crap is Stephen Curry amazing. I mean some of the shots he made against the Spurs on Monday night were insane! Plus, he’s been doing that kind of thing on the reg for the past month or so. Throw in some sweet-shooting from Klay Thompson, David Lee’s automatic double doubles and questionable defense, plus all the great role players (Jack, Landry, Green) that the Warriors have and you have a great matchup for the Nuggets. But, the Nuggets are the Nuggets and they are going to win this series. Lawson looked as fast as ever coming back from injury earlier this week and I know that Faried will play as hard as possible no matter what lingering pain he may have when the Playoffs start. Even without Gallinari, this team is going to be fine. They were constructed for this kind of scenario. Corey Brewer, Wilson Chandler and Evan Fournier (!) are all capable of filling in collectively—or getting scorching hot singularly (especially Chandler)—on a given night to match Gallinari’s numbers (16.2 ppg, 5.2 rpg and 2.5 apg). Plus…JAVALE MCGEE! Lawson is going to run. Curry is going to run and shoot and do this. Iguodala will dunk. The defenses are going to be bad and it’s going to be fun. Part of me is sad that this series is just a repeat from last year. I don’t want Memphis or the Clippers to have to eliminate each other. I’d like to see each of them get beyond the first round. Both teams have a unique identity. Both teams have signature super stars and role players. Both teams have great fans and home courts. I want to see them each play longer. That being said, last year’s seven game series was a war. Last year’s series featured one all-time classic (the Game 1 Clippers comeback), a bunch of memorable, tight games, and, unfortunately, a lame Game 7. This year, there is still residual bad blood and the stakes are actually even higher. Each team won 55+ games, which means that their entire season will be deemed a failure if they lose in the first round. In fact, I’d go so far as to say that whichever team loses this series could face one or two significant personnel changes in the off-season. (If the Clippers lose, does Chris Paul stay in L.A.? Does Memphis think about trading Randolph if they are bounced?) Blake and Zach officially do not like each other and with the pressure this high, I would not be surprised if we saw an actual fight in one of the games. We know all the players: Chris Paul is divine; Blake is a star and a freak athlete; Marc Gasol may now be the best center in the league (and is the best passing big man); Zach Randolph is a master on the boards; Mike Conley has taken his game to another level at point guard; Jamal Crawford has confidence for days and could catch fire at any moment; Tayshaun Prince is a smart veteran with championship experience; Matt Barnes is gritty; Caron Butler can hit a big shot when you need him too; plus, Grant Hill, Ed Davis, Willie Green, Jerryd Bayless…ERIC BLEDSOE! There’s not much more you can say—I’ve already worked myself into a frenzy with excitement and anticipation. This series comes down to home court advantage. Each team can win on the road, but having that unruly crowd at your back for Game 7 can make a difference. Last year, the Grizzlies blew their advantage. Will the Clippers do the same this year? For some reason, I don’t think so. Oh, right, that reason’s name is Chris Paul. The NBA really is a funny league. I think if the Spurs were the number one seed, and the Clippers had to play them in this spot instead of the Thunder, that they would probably get swept again. However, they seem to match up better against the Thunder and I think this will actually be a close series. Also, my God the dunks! 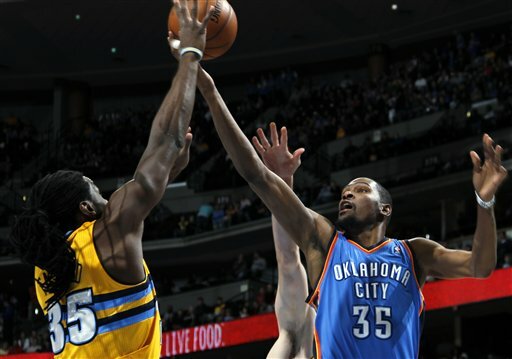 The Thunder won the season series 3-0 and by an average margin of seven points. But, as we know, the season series doesn’t mean everything. Both of these teams are deep and athletic. The Clippers’ bench has the edge with their variety of wing players and athletes (Crawford, Bledsoe, Barnes, Green, Hill). However, in the Playoffs you play your best players as much as you need to and either Durant or Westbrook will be on the court at all times. The key to this series is Westbrook. The Clippers don’t really have an athlete that can match Westbrook on defense. Chris Paul is the Platonic ideal of the point guard, but he is not a freak athlete like Westbrook. Eric Bledsoe is a freak athlete, and they may use him for his speed and defense to try and hound Westbrook in spots, but I don’t know if that will be the answer. Barnes, Hill, Butler and even Blake can all take turns on Durant in an effort to slow him down and show him different defensive looks, but the Clippers just don’t have the same variety when it comes to Westbrook. The frontcourt edge (Griffin/Jordan vs. Ibaka/Perkins) goes to the Clippers, but it’s not a sizeable advantage in the series. It won’t be easy for the Thunder (they’ll lose Game 2 and Game 4), but they’ll win the series. Like many people, I’ve learned the hard way that you never count out the Spurs. However, the past two seasons (scaling last year’s shorted season to a full season) the Spurs have won over 55 games and fallen short of the Finals. In fact, the Spurs haven’t made the NBA Finals since their last championship in 2007. Obviously, it’s a difficult task to consistently reach the NBA Finals, but something about the Spurs just strikes the wrong chord with me this year. I mean last season they looked unbeatable up until Game 3 of the Western Conference Finals and then the entire thing just fell apart. The Nuggets are banged up, but like I said earlier, I don’t think the Gallinari injury is going to affect them as much as people think, and I believe that Faried can gut out enough production using the extra rest between games as a “crutch.” This series will depend on how Ty Lawson’s health holds up and on how much Kosta Koufos and JaVale McGee can give the Nuggets. I think if McGee and Koufos (with help from Faried) can slow down Duncan and Splitter and Lawson can put enough pressure on the Parker (with Iguodala providing spot shut-down defense at the end of games), that the Nuggets can win this series. For almost fifteen years, the Spurs have been a machine of intelligence and efficiency, but this Nuggets team was specially built to win in this current changing, sabermetrics driven NBA landscape. I think they are going to prevail. And it’s going to be fun to watch Lawson and Parker go at it each game. Prediction: Nuggets win series 4-3. That’s the only word that you’re going to need to describe this series. Sure, there will be X’s and O’s and George Karl is going to help the Nuggets steal a few games by simply being a better coach than Scott Brooks*. However, the rest of this series is just going to be about speed and athleticism; perhaps even more than last year’s Finals. We know that Durant, Westbrook and Ibaka are world-class athletes. However, the Thunder also have the emerging Reggie Jackson (a freak in his own right) coming off the bench to go along with Kevin Martin and Nick Collison (well, OK, those two aren’t really that athletic anymore). But, the Nuggets just have a “murder’s row” of athletes: Iguodala, Lawson, Faried (sprained ankle and all), McGee (goofiness and all), Anthony Randolph (randomness and all), Evan Fournier, Wilson Chandler, Corey Brewer, and Andre Miller (just kidding; that old man game, though). When it comes down to it, I just think that the lingering injuries that the Nuggets have aren’t going to go away over the course of the Playoffs. Sure the days off between games and between series will help Denver, but the increased physicality of the games, combined with the speed this team plays at will take a toll after awhile. And when you play Oklahoma City, you need to be able to match them move for move; explosive play by explosive play; wave of energy after wave of energy. In the end, I just think the Thunder have the edge in health and the extra urgency and pressure to win. Prediction: Thunder win series 4-2. With apologies to Knicks and Lakers (and I guess some fundamental basketball fans who just adore the Spurs and the people who love fun that wanted to see the Nuggets break through) fans, this is the Finals matchup that everyone wanted to see. Last year’s Finals were good, but somehow it seemed odd that the series ended in five. Though we were satisfied by a fistful of close games and satisfied to see Lebron win a title, there was a palpable aftertaste of robbery once all the confetti had been swept away. I wish I could promise you a full-on, legendary seven game series for this year’s Finals, but I can’t. The fact is that Miami is better than they were last year and the Thunder…well, they aren’t. Durant and Westbrook are both having their best seasons (Westbrook’s numbers this season are almost identical to Derrick Rose’s numbers from his 2010-2011 MVP season), and, while Ibaka has been very good, he hasn’t really taken the leap you would expect from a guy who will be making $12.3 million next season. Meanwhile, Miami’s offense is as dynamic and fluid as any in the league and far better than it was in last year’s series. Lebron is the best player in the world and possibly the best player since Michael Jordan. Wade is playing more efficiently than he ever has in his career. Bosh is solid (16.6 and 6.8) if slightly underwhelming. Chalmers is having his best all-around season and is shooting 40% from three-point range. Battier and Allen are capable of hitting big shots at any time. Haslem will hit the glass. Norris Cole has shown an increasingly steady hand at backup point guard. And the Birdman has been a revelation as a defensive stopper and an at-the-rim finisher. In fact, and the Heat are 39-3 since he joined their roster. Just think about that for a second. Plus, Mike Miller, Rashard Lewis, Joel Anthony and James Jones will be fighting for playing time and they were a key part of the Heat’s rotation last season. You might remember Mike Miller from such movies as…THE TIME HE TURNED INTO A WALKING PIECE OF PLASMA AND DESTROYED THE THUNDER’S CHAMPIONSHIP DREAMS. I see this series being very similar to the ’86 Finals. That series featured a legendary Celtics squad that went 67-15 and a feisty Houston Rockets team that showcased Akeem (at the time) Olajuwon and Ralph Sampson. That Rockets team managed to steal two games off a historic juggernaut and I don’t think they were as good as this year’s Oklahoma City team. So, what I am saying is that Miami will win the first two at home. The Thunder will win Game 3 in Oklahoma City. Game 4 will come down to the wire, but Lebron will hit a dagger three that pushes the game out of reach. Durant will explode in Game 5 and the Thunder will send the series back to Miami. Game 6 will be close (think Game 6 of the 1993 Finals) and the Thunder will have a chance to win, but—much like Jordan’s Bulls teams used to do—Miami will take the victory away from their very worthy foes and repeat as NBA Champions. It’s going to happen for Kevin Durant, but just not this year. Not against a Miami team that was scary in last year’s Finals, but got even better as this season progressed. It’s not personal, it’s just history. Prediction: Miami wins series 4-2.